Swiss watch brand GLYCINE announces the return of its “oversized” classic KMU 48. The imposing manual watch delights with its harmonious synthesis of watchcase, dial, movement and strap. With its 48 mm diameter, the KMU makes a familiar and striking impression on the watch market without straying from Glycine’s deliberately chosen path of always being one step away from the mainstream. The KMU 48 is being relaunched in a steel version with black dial and an extra-large second display at the six o’clock position, as well as discreet brown hands with strong luminous material. The heart of the watch is a specially decorated and precisely worked manual winding movement, which is enclosed by a stylish smoked-glass back. A special treat for watch lovers is the limited series of black PVD coated watches powered by the calibre, Unitas 6497. Glycine has devoted particular attention to the design of the dial. The dial is a wonderful construction on two levels with extra-large second display at the 9 o’clock position. Two hundred and fifty pieces of this classic contemporary watch have been made. The origin of the KMU 48 goes back to the well-known military watches of the last century. 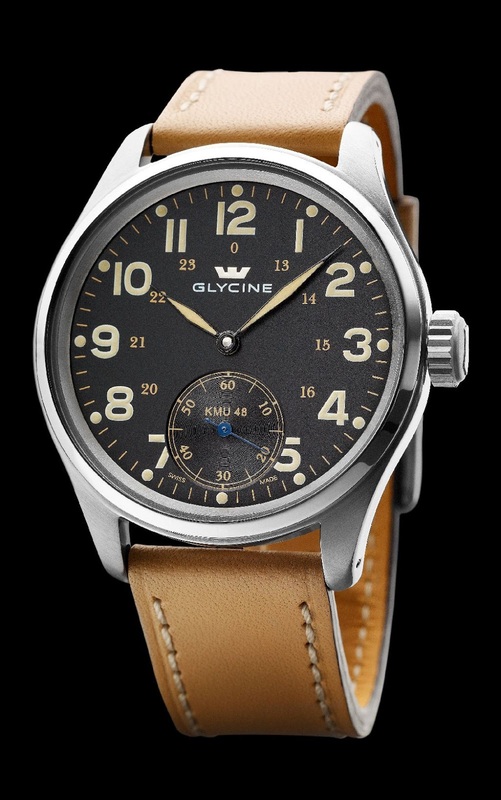 Glycine launched the first replica of such watches as early as 1999. In the meantime, demand has grown so strong that the KMU 48 has established itself firmly as a distinct family of watches in Glycine’s proud collection.